Brexit feels more ‘real’ to people in Northern Ireland than in England and immigration is a less polarising issue for the public, according to series of new reports released today from the National Conversation on Immigration, the biggest-ever public consultation on immigration. With new immigration statistics released today by the Office for National Statistics, the research finds that most people in Northern Ireland are ‘balancers’ on immigration. While some participants on the Citizens’ Panels – held in Derry/Londonderry, Dungannon and Ballymena – voiced concerns about the impacts of immigration, including on school places and the NHS, most see both pressures and gains from migration to their local area. Participants often referred to family and community histories of migration and this made them more understanding and sympathetic to migrants and more relaxed about integration. In every panel, researchers heard worries about Brexit, from the inconvenience of a hard border to its potential impacts on the economy, investment and the peace process. Immigration was lower down the list of public concerns than in England, with researchers also finding fewer concerns about social segregation in Northern Ireland than elsewhere in the UK. 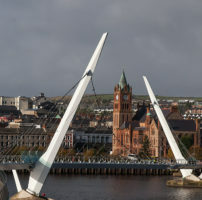 In Derry/Londonderry, access to social housing and welfare benefits, competition for jobs and security risks were key issues raised by the panel. The Ballymena panel felt that the benefits of migration outweighed negative impacts. Half of those consulted were happy for the numbers of high-skilled workers from within and outside the EU to be increased, with most others happy that numbers remained about the same. People in Dungannon were ‘balancers’, seeing impacts and benefits from migration. The town has experienced very rapid population change, due to EU migration, but it has not caused the resentment and tensions of some parts of England. People felt the contribution of EU migrant workers to the local economy was significant. In each location researchers held a citizens’ panel made up of members of the public from the local area and a stakeholders’ meeting including representatives from local government, business and civil society organisations. A further stakeholder meeting was held in Belfast. The National Conversation provides an opportunity for members of the public to have their say on immigration policy after Brexit in a way that will be heard by decision-makers. Coordinated by independent, non-partisan thinktank British Future and anti-prejudice campaigners HOPE not hate, its interim findings are submitted as evidence to the Home Affairs Committee’s Inquiry. An open online survey allows everyone in the UK to have their say in the National Conversation. A final report will be published later this year, incorporating the poll findings and survey results together with recommendations. An interim report was released last week, alongside the first report of the Home Affairs Committee.